Hi all, how goes it tonight? Some weeks back, I picked up this pretty red with another pink from Missy C's lovely online boutique Usually, I'm not good with a bright red, because I think it makes my hands look gigantic. Unfortunately, the big hands are hereditary (never mind), so I'm just going to have to accept it. 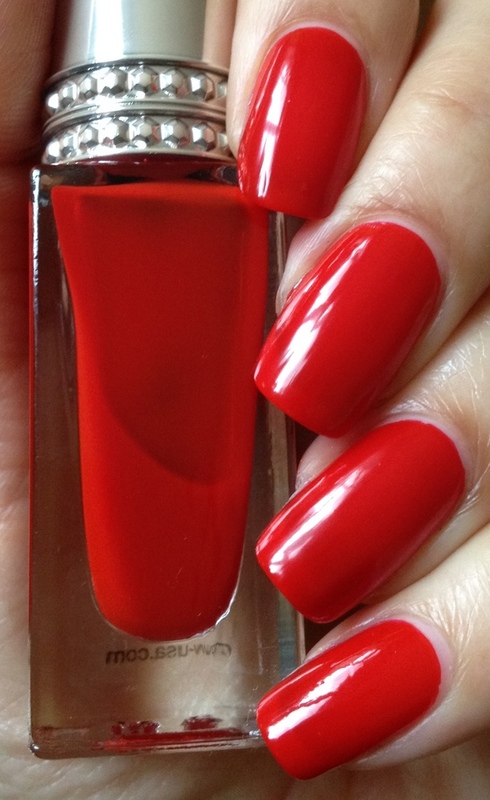 This is three coats of 'Crack the Whip' - a vibrant red with a jelly finish. Application was a breeze and the formula was very smooth. The brush is wide, flat and has a rounded tip, so it's quite easy to paint tidily near the cuticle without too much mess. I did have a visible nail line after three coats, but this could easily be remedied by using a cream red first. I like it like this though. What do you think? Do YOU do red? P.S. If you're looking for red nail polish, try looking at Buy.com with these coupons! This is absolutely stunning on you!!! This red is gorgeous! And yes, I do red!! IMO, everybody should. It's such an amazing color. Thanks Marisa! I usually go for a darker red, but this one looked gorgeous in the bottle so I had to have it. You might not think like me, but red is your color! Your nails look gorgeous in red!!! Looks great on you, love the detail on the bottle lid too!